Original release, aqua blue label. Fred MacMurray sings The Flubber Song. 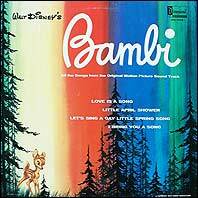 Early issue with cover showing Bambi alone in forest, yellow label. Cover artwork is a little worn. Original release. With Angela Lansbury, David Tomlinson, Roddy McDowall. Gatefold cover with scenes from the movie. Includes Disney promotional postcard. Disneyland "rainbow" label. Small writing on back cover. Second issue with cover photo of the 1964 World's Fair exhibit. 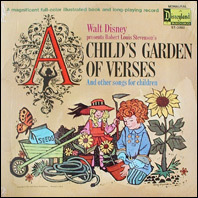 Songs by the Disneyland Boys Choir, narration by Winston Hibler. Includes intact 11-page storybook insert. "Yellow rainbow" label. Sterling Holloway narrates. Early issue with primrose yellow label. Cover, which is slightly creased, shows Peter and Tinkerbell looking through a window. Back cover has photos from the film. Cover shows Peter and Captain Hook on a cliff. Small writing on corner of back cover, otherwise excellent. Red label with black type. Gatefold cover with 11-page storybook in fine condition. Primrose yellow label. Orchestra conducted by Camarata. 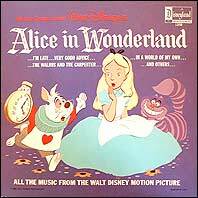 Includes pop-up panorama storybook in excellent condition; vinyl heavily used.